Buy this book. Read this book. Will that do for you? No? Allow me to explain. 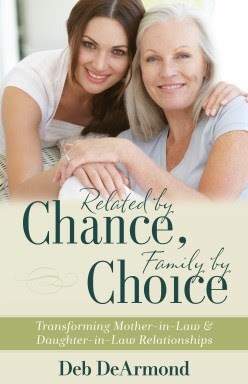 I was asked if I'd like to participate in a blog tour for Related by Chance, Family by Choice : Transforming Mother-in-Law and Daughter-in-Law Relationships and I said "yes" pretty quickly! Why? Well. Fitting into my husband's family was not easy for me and I think that was due to a multitude of factors, one being that I was an idiot. Truth be told, I hate thinking about that time period in my personal history. If I had it to do all over again . . .
Having a good MIL/DIL relationship is not something that comes particularly easy to me (again that idiot thing) but I have been blessed, despite many missteps. In particular, I have really enjoyed being able to develop a good relationship with my second MIL. (My first passed away.) My current relationship is not "traditional" in the sense that we're attempting to share a relationship with her son. The family history isn't long standing and so that makes for a different situation. Still, K has been willing to step into the position of the mother-in-law in my life and that has proved a great blessing to me, personally. I truly love her. Let's start by asking ourselves a question. Why do we read books? The answer is varied with "for enjoyment" being at the top of the list. But we also read to learn. Sometimes we just read to firm up our own worldview. I would suggest that we should also be reading so that we can learn how to give more godly advice to other people. Because I spent a few years receiving very poor advice, I covet and value the advice of people who have put some time and effort into understanding what scriptures have to say about the way we relate to others. I know that there may be a temptation to skip this book if you have a good relationship with your WIL but I would have to beg you not to. I can't tell you how many times I would ask another (usually older) woman a question and would receive a response that sounded an awful lot like this: "Wow. I don't know what to tell you." Or, "That's too bad. I have a great relationship with my MIL. Luck of the draw, I guess!" It was so very discouraging and disheartening, especially when I knew I had a great mother-in-law . . . . I just needed help getting to know her better. I wanted to do right things. I wanted to honor God in my relationship. Good advice proved hard to find and as a result, I would be very quick to slap a copy Related by Chance, Family by Choice into the hands of any woman who would be humble enough to read it, recognizing that God may have them in a position where someone else needs to hear solid, Biblical advice and have come to them seeking for some answers. To help women be prepared to 'give an answer' for the things they believe, I feel strongly that this book ought to be read. If you don't read it for you, read it for someone else and think about the topic anyway. For the record, the author of this book, Deb DeArmond, has three "daughters-in-love" that she gets along great with. (She explains why she prefers the term "love" over "law". For my part, I've always thought that sounded a bit eye-rolling so I prefer to stick to "law" as a personal preference. I don't buy the fact that saying "love" indicates "peace" and so I'd avoid using it.) During the course of writing this book, she surveyed several women about their WIL relationships. Most of her personal stories, and those that she shared from others, are positive. The large majority of women seemed to think that, at the very least, they had an "ok" relationship with their in-law. Of course, there are always exceptions and we all know people who, for one reason or another, just do not click with their WIL. It happens. Instead of offering her readers pity if their relationships are not as they would wish, DeArmond instead talks about what the relationships should look like and why. In certain respects, she offers a step-by-step of what your heart attitude should be like when you first meet your in-law, to the engagement period, during early married life, and when grandkids enter the picture. Her advice is not laid out in chronological order but she does hit on all of those stages. She takes a bold approach in addressing who has the "right" to make demands, how to treat the man in the middle, and how to respect the other person even when you don't necessarily like them. What is DeArmond's general belief about the MIL/DIL relationship? It is that they ought to find ways to not just "get along" but become family. And DeArmond makes bold-faced honest statements about the emotions we women frequently experience when we are trying to do this important and difficult thing. She also hits on why it is so important to build up and preserve this relationship. Christian, stop and think about this for a second. And what about the man in the middle? DeArmond argues that he is entitled to a relationship with both his mother and his wife. (The wife coming first, but the mother also caring and playing a role, even if it is different than the one she played when he was a young boy.) Stop and imagine just for a second what it would be like if both the man's mother and his wife were praying for him and cheering him on? Together. Pipe dream? DeArmond doesn't think so and I don't either. I have 'tasted and seen the goodness of the Lord in the land of the living' and so I am of the firm opinion that God can turn any relationship around and make something truly beautiful and joyous out of it. Just to be clear, while DeArmond does have a hope and belief that all WIL relationships can operate well, she fully acknowledges that some come with very hard challenges. She also offers some and advice and counsel for those cases, sharing how one party or the other can protect themselves from harm while still showing respect. I really could go on and on in talking about this book. I find it very necessary, especially in a day and age when we're all encouraged to be individuals and go it alone, more or less. The thing is - we weren't designed to 'go it alone' and Christian women really ought to learn how to get along with one another for the sake of their relationship to Christ and with His Church (if for no other reason). Please remember, I say this as one who had a really rocky start but who God saw fit to deal with, regardless. For this I am eternally grateful. I only wish that other women would work hard to know how to respond to a young married woman who comes to them with a question of how to develop a relationship with a mother-in-law who she may not like right away, but longs to love. Many thanks to Litfuse Publicity Group for sending a copy of this book my direction in order to facilitate my long, drawn-out thoughts on the topic. I received no additional compensation for this book and my opinions, as always, are 100% my own and are owned up to. Enter Today - 11/11 - 11/30! This sounds great! I've been blessed with a good (GREAT, actually) MIL, but I know my own attitude could use adjusting at times. You have me more excited to finish it sooner now! Carry, thanks for your transparency in telling us a bit about your story. Me surveyed more than 200 women, interviewed and ran focus groups with nearly 50. The stories blew me away. It's such a common experience for so many. I'm grateful you found the good to be valuable and could recommend it to others. Thanks, too for your review. I'd love for you to post it on Amazon if you have the chance in your busy day! This is on my wish list! It sounds like a good book to have in ones library. Why do I feel like I read your review of this book already? Did you review a different book about in-law relations? That one is not written from a Christian perspective. It does have practical advice and I still think that that title is useful, but newer one is better (esp. as/for Christians). I also don't care for the "in-love" designation rather than "in-law." This does sound like a good resource. We lived 2,000 miles away from my husband's folks, and we liked being on our own, but there was some distance there, both physically and in the relationship, though we enjoyed communicating with each other and had common interests (especially books). We did have some rough spots and probably would have had more if we had lived closer.